Previous China trip posts: Shanghai. 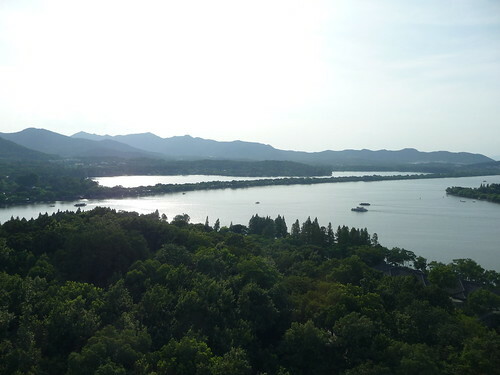 From Shanghai, we took a train to Hangzhou, where we met our new guide (Joe from Hangzhou, a legendary figure among our tour group already) and went about exploring the city’s main attraction, the West Lake and its attendant pagoda. By the way, the train itself was very nice. Quick, quiet, safe, clean. Nice. Hangzhou was pretty. It’s way smaller and cleaner than Shanghai, and has many more green spaces. This made the weather, which was still hot and stifling, feel a little bit better. The West Lake is beautiful and well worth the visit. We took boat trip around the Lake and had a good time. The Leifeng pagoda nearby offers great views of the lake and the city. It’s worth climbing up to the top. At the plantation we got a tour and a lengthy explanation about Chinese tea, from another funny guide, who called himself Dr. Tea. I kid you not. Then there was the obligatory sales attempt, not too forceful, but still annoying.